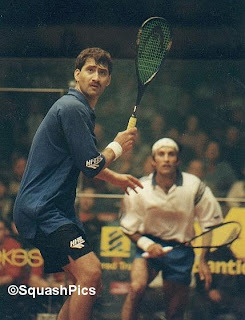 The squash world did a collective double-take this week, as reports coming out of Pakistan suggested that former world number one and multiple World and British Open champion Jansher Khan is to come out of retirement. The 38 year-old from Peshawar has announced his intention to play in a "minor world-ranking event" in London in October. Details at scant at present, though the Reuters website reports that it will be held "in London from Oct 11". "The reason for my comeback is that I feel I am mentally and physically fit to play the international circuit for another three to four years". For fans such as myself who did not get to see the legend at the hight of his powers such an appearance is a must-see. For the current crop of male pros, the chance to play one of the game's greats is an intriguing prospect that would be hard to turn down and, as such, should help to boost the profile of the event and raise the prize purse on offer. Hasn;t Jansher tried to come back before? Surely he can't hope to compete with the guys in thetop ten - they are too fit. I reckon he will appear in this one tournament and the disappear again, though it would be great to see the legend back on court.